18/02/2015 15:26:49,561  | INFO  | > Delayed. 18/02/2015 15:26:49,561  | INFO  | > Libraries loaded. 18/02/2015 15:26:49,621  | INFO  | > Installed 4 hook(s). 18/02/2015 15:26:49,621  | INFO  | > Libraries loaded. 18/02/2015 15:26:49,727  | INFO  | > Installed 8 hook(s). 18/02/2015 15:26:49,728  | INFO  | Initialized. 18/02/2015 15:26:49,757  | INFO  | > Installed 360 hook(s). 18/02/2015 15:26:50,452  | INFO  | > Switched to new runtime 04DE6D28. 18/02/2015 15:26:50,457  | INFO  | Recreated effect environment on runtime 04DE6D28. 18/02/2015 15:26:50,484  | INFO  | > Switched to new runtime 04E58D98. 18/02/2015 15:26:50,488  | INFO  | Recreated effect environment on runtime 04E58D98. 18/02/2015 15:26:58,429  | INFO  | Exited. Tried both manual and auto install, tried sweetfx too. Tried turning shaders off, doesn't work. Are you updated to the latest AMD drivers? Does this happen with all effects in MasterEffect turned off ("USE_..." set to 0 inside the fx)? Hi please read my post again. I disabled everything. "turning shaders off" can mean a lot of things =), pressing scrolllock to disable their rendering (which is what I thought you meant), removing the shader file, etc. Anyway, this is not MasterEffect you are compiling there, it's the example shader that comes with standalone ReShade. Where did you put MasterEffect? It should go besides ReShade into the game folder. This is still not MasterEffect. It is still the example shader. Has to go to "D:\TODELETE\ReShade.fx". Last Edit: 4 years 2 months ago by f94585. Funny how that matches that signature a 100%. So the code ReShade generated there is correct and spec conform. Your driver on the other hand is not. Now this works just fine on other AMD drivers, so again, are you running the latest ones? Which version? Does it fully support OpenGL4.3? SORRY I thought I was running the latest intel driver, but the system restore from a few weeks ago must've reset it. I'll test it tomorrow. Oh. I read that "HD4000" thing as a AMD Radeon HD 4000 series card, not an Intel HD 4000, sorry (please be a bit more specific in such situations, I'm no mind reader. Also, I don't see where you are naming your driver version there, which is what I was actually asking for =P). And for Intel it's especially important to be on latest drivers. As said, ReShade requires at least OpenGL4.3 (preferably higher) and intels support for it is a bit slow (not sure if they managed to fully do it up until now). So it might not work even with up to date drivers. Well, maybe it's just a different naming convention for driver package(which includes audio drivers) and graphics package. 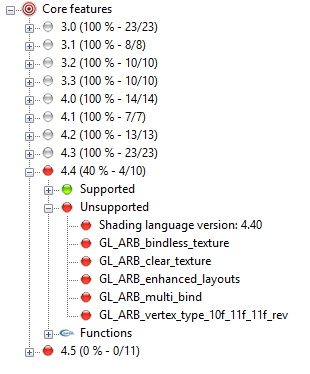 Nevertheless, as you can see it says it supports oGL 4.3, with an asterisk next to "OpenGL". I don't know what it refers to and couldn't find anything about it. Maybe Intel GPUs need some extra gl calls to enable 4.3? It could be that some extensions are missing (wouldn't be the first time, eh?) but that doesn't really explain all those errors. But then again my understanding of this all is super surface-level. Alright. Well I guess that star means there are some limitations and stuff they don't support, which apparently includes biased texture sampling (which is the reason for that compiler error, it's only a single error, the rest are just followups of the first). I can either try and implement a workaround for Intel cards or simply remove support for biased sampling altogether (couldn't find a single shader using it yet, so I guess that's fine). Here's the dev guide for this GPU("series"). Removed the "tex2Dbias" function from 0.15.0, so that should be fixed there. Also reported this to Intel, so to have a chance they get their driver fixed and I can include it again. Last Edit: 4 years 1 month ago by f94585.